How Much Does a Super Bowl Ring Cost? The Super Bowl is here once again, and the time has come for large men to hit other large men in the large stadium displayed on the large TV that you are yelling at largely -- sorry, loudly. But once all that's over, what large award awaits these modern-day gladiators? Eternal, manful glory? The admiration of dadbod-havers across the nation? Perhaps. But the real reward is jewelry. On Sunday, the New England Patriots will face off against the Los Angeles Rams in Super Bowl LIII for those fabled Super Bowl rings, attainable only by top tier athletes and the PR people who work for their franchises. And yes, you could be checking stats and setting bets right now, but let's be honest, this insane hunk of metal is far more interesting. So, here's everything you're wondering about them. This is a more complicated question to answer than you'd think, in large part because the prices franchises pay for the rings are kept secret. We'll do our best though. For starters, CNN reports that the NFL is willing to pitch in a cool $5,000 per ring, for up to 150 rings. The rest of that (substantial) cost is paid for by the winning franchise. These bands are often encrusted with thousands of dollars in gemstones alone -- so, in short, they cost a bunch of money. 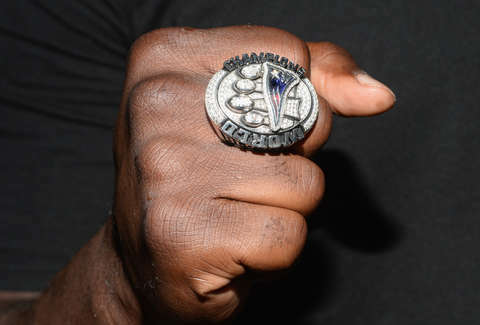 As for the one that's gone for the most, Lawrence Taylor's Super Bowl XXV New York Giants ring sold for $230,401 back in 2012. What is the ring made out of? This will also vary from team to team and year to year, but you can definitely expect diamonds and gold. Last year's Philadelphia Eagles ring had 127 diamonds just on the bezel. That being said, it's common for players to get their names and jersey numbers on a personal ring; then owners, coaches, and even extended associates like PR teams will get slightly toned down versions of the rings. So even within a single year, it's hard to say exactly what it was made of, except to say lots of diamonds and gold. The memorabilia manufacturer Jostens has made the majority of the Super Bowl Rings -- 33 so far, including the first one. No matter who makes them and what they're made of, though, you can be sure that each is handcrafted and garish as all get-out. What does the Super Bowl 53 ring look like? In short, we just don't know yet. Talks about possible rings don't usually start until after we actually know the winner (because, you know, superstition). Once there is a winner, a design phase starts that could take up to eight weeks, and then a production phase that will likely last around four weeks, according to CNN. Charles Haley and Tom Brady are tied for most Super Bowl rings, with five each. If you're not familiar with Charles Haley, he took home Super Bowl victories with the 49ers in the '80s and with the Cowboys in the '90s. As for Tom Brady, well, you can read all about his diet here. But there's a good chance that Brady breaks the tie this year and picks up his sixth ring. And to think, you don't even have one.